Currybet.net: Will social media’s influence on political engagement continue post-election? The Guardian’s Martin Belam has produced a great summary of the panel debate at the launch of Nic Newman’s Reuters Institute for the Study of Journalism (RISJ) paper on social media and the election, on his site currybet.net. The research document, titled ‘UK Election 2010, mainstream media and the role of the internet’, outlines the significant role social media, in particular Twitter, played in informing the public during the election process. People need something to be engaged with. It remains to be seen whether the major parties will continue with digital campaigning, or whether, rather like leaflets, we will see a lot of them at election time and not much in between. Outlining the main findings, Newman reportedly told the audience that Twitter became a “political newswire” as well as having a direct impact on the behaviour of politicians. The best of the social media – jokes, spoof posters, reaction on Twitter – was reflected and amplified by the mainstream media. This ultimately influenced the behaviour of the politicians. David Cameron, for example, toned down his habit of citing anecdotal stories of people he met after it was spoofed online. (…) William Hague announcing he was about to go back into negotiations with the Liberal Democrats via Twitter suggesting the service was beginning to be used as ‘a political newswire’. This entry was posted in Editors' pick, Politics, Social media and blogging and tagged election, ge2010, Martin Belam, reuters institute for the study of journalism, RISJ, social media, social media engagement, Twitter, uk election on July 16, 2010 by Rachel Bartlett. Video from Sky News showing how it put together its coverage of Gordon Brown’s resignation and the post-election coalition talks between the Conservatives and Liberal Democrats. Related reading: Sky News’ Niall Paterson on “bigotgate” and the parliamentary press pack. This entry was posted in Broadcasting, Editors' pick, Journalism and tagged Broadcasting, ge2010, general election, political journalism, Politics, Sky News, uk election, Video on June 30, 2010 by Laura Oliver. As part of its election coverage the Times attempted to chart the relationship between the news agenda, represented by Times reports and articles, and the political parties’ perfomances in the polls. Each bubble in the above graph is a news story. Its size reflects the number of comments it received on our site, and its position (on the y axis) indicates the number of recommendations the story received. (The basic idea here is that, the higher and larger the bubble, the more ‘important’ the news story, assuming that larger, more important stories tend to get commented on and recommended more.) Colours show to which party a story relates. The lines show (depending on the tab) either Populus polling results, or the number of seats the parties were predicted to win during the campaign based on Ladbrokes odds, which are used elsewhere on the site. 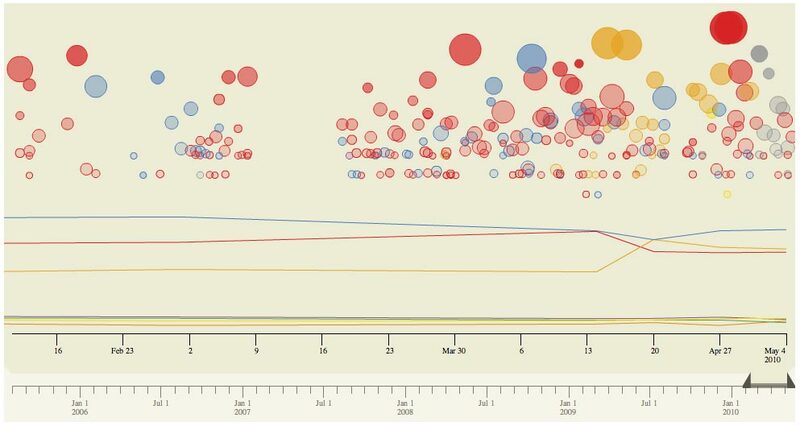 This entry was posted in Online Journalism and tagged data, Data journalism, data visualisation, ge2010, general election, Politics, times, uk election, visualisation on May 7, 2010 by Laura Oliver. Lunchtime Friday and still no clear answer. The British people have spoken but in a divided way. The politicians are wriggling to get advantage or cling on to power (you decide). The most exciting election campaign of modern times has been followed by the most exciting night of election drama of modern times. 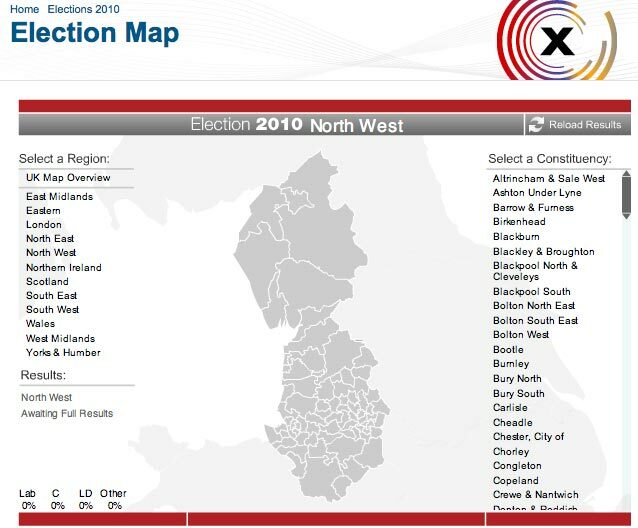 Nowhere was the drama greater than here in Northern Ireland where I was working on election night – the other election, often ignored by those ‘across the water’. First casualty, Northern Ireland’s First Minister Peter Robinson whose 31-year stint as MP for East Belfast ended in stunning defeat by a woman of the centre – Naomi Long of the Alliance Party. Robinson has had an annus horibbulis having to face television investigations announcing his wife’s affair and, after that, his own land dealings came under scrutiny. Last night was his nadir. He rushed to the count at Newtonards Leisure Centre, spoke briefly to the local media and was then ushered out. Now he has gone to ground to lick his wounds and fend off predators. The Robinson moment was magic telly: milked by the local outputs, but less so by the networks. They wanted more of Lady Sylvia Hermon, who defected from the Unionists when they joined with the UK Conservatives. The Traditional Unionist Voice (TUV) were seen off in what should have been their heartland North Antrim by Ian Paisley Jnr – brands are as important in politics as anywhere else. He and father – who preceded him in the seat for 40 years – showed their contempt for the TUV by singing the national anthem before his victory speech. Worse for ‘moderate’ Unionism, Sir Reg Empey lost out in South Antrim to the Democratic Unionist Party (DUP). The planned Tory beachhead in Northern Ireland became a washout. It was a media confection. The BBC Northern Ireland Election programme ran for seven-plus hours using all the 18 counts at eight locations as their prime material. Down-the-line interviews galore at the outside broadcasts based on deep local knowledge. The local commercial station – Ulster Television – did not even make it to the starting line. No election news between 10:30pm and 09.30am. That did not go unnoted by fellow hacks. The BBC’s ‘Dimbleby programme’ had a magnificent set on its side and some pretty special Jeremy Vine virtual reality graphics too – my favourites being the Downing Street staircase or the House of Commons with real faces smiling and nodding. Modern Television journalism is about entertainment and keeping it simple. Nowhere more so than in the use of electronic graphics. All of that plus live reporting from many of the big beasts of telly journalism. It’s fascinating to see how many of them still used the basic journalistic skills, like Kirsty Wark doorstepping/walking besides and interviewing Nick Clegg on the hoof on the way to his count. Read John Mair’s report from the BBC’s TV ‘hub’ in Belfast on the build-up to election night. This entry was posted in Broadcasting, Comment and tagged BBC, Broadcasting, ge2010, general election, Northern Ireland, Politics, uk election on May 7, 2010 by John Mair. Produced in associated with Channel 4 and the New Statesman, Guardian.co.uk’s election coverage features a map plotting voter turnout. It’s reliant on people tweeting when they’ve voted with the first half of their postcode and the #ukvote hashtag, but gives a good real-time picture of where the votes are coming in from. The goal of the experiment is to inspire more people to vote and to help get a sense of turnout during the course of the day and across the country. Channel 4 News is also trying to gauge turnout using a poll as part of its election day liveblog, which dominates its homepage today. The Guardian has also changed the layout of its homepage to incorporate more election coverage – particularly like the way it highlights the latest updates from its election day liveblog as part of the top stories box. Ahead of tonight’s results the Telegraph has a handy guide to when constituencies will be declaring and which party is targeting which seats. The BBC has its live page up and ready for tonight and is promising to use all its multimedia resources to boost its online coverage, with a liveblog of the results for those following online and on mobile and streams of the best radio and TV footage from the BBC via the website. Particularly nice is the slideshow of how to vote – the practicalities not which party to vote for and the option to download an election night party pack. As part of extensive election night coverage online, Sky News has a handy, hour-by-hour guide of what happens on election day and has Facebook chat around the election added to its liveblog, so users can post status updates from the Sky site. The Financial Times is hosting an election special on its Westminster blog for election day; while the Times’ group blog Election ’10 is worth a mention for today’s blow-by-blow coverage and its offering of analysis, news and commentary throughout the election campaigns, balancing live and need-to-know with deeper commentary. We’ve written about the opportunities for hyperlocal, independent news sites in covering the general election and its seems tonight will be no exception. Expect liveblogs – Sunderland blog SR2 Blog is hoping to be one of the first sites to report a results, while Blog Preston has recruited student bloggers for the task; and live tweeting – new site for Manchester Inside the M60 will be tweeting the results live and posting them to the site as soon as they come in. Let us know if you’re planning something special for tonight or trying out some live reporting for the first time in the comments below. Tweetminster gives an unrivalled view of tweeting going on during election day, filtering tweets from politicians and prospective parliamentary candidates, as well as mapping voter turnout by tweet and trending topics. Facebook has set up a live vote count showing how many Facebook users have said they’ve voted, as well as pulling in news updates from external sites and polling users on its Democracy UK page. And finally, if just for fun, a picture of how tweeters are aligned by party from @jaygooby. If you’re a journalist, blogger or just an interested party let us know how you’re reporting and following election night as it happens. This entry was posted in Online Journalism and tagged elections, ge2010, general election, Politics, uk election, Voter turnout, voting on May 6, 2010 by Laura Oliver. The journalist from Sky News was in some kind of hysterical state of tumescence as he cackled “Gordon Brown’s done a gaffe and we wondered if you’d come on to respond. You’ve got to see it!” on my answering service, and I’m sorry I deleted it rather than release it in to the public domain. The BBC was no less sensationalist in its pokey recording of Brown sitting listening to his own surreptitiously recorded voice played back to him. It’s at these moments that you stand back and see, not a nation debating its future, but a pack of shrieking gibbons. Thankfully, though, Bigotgate seems to have had no impact on the polls. This has restored my faith in this election as a sober, sincere and considered affair, though it’s shed a light on what the media machine can do when it’s taken too much Red Bull. This entry was posted in Editors' pick, Journalism and tagged armando iannucci, bigotgate, ge2010, gillian duffy, Gordon Brown, political journalism, Politics, uk election on May 4, 2010 by Laura Oliver. Former diplomat and blogger Craig Murray has been accused of libel by polling company YouGov. YouGov is unhappy with what it claims are defamatory allegations made by Murray about its leaders’ debate poll and its CEO, Stephan Shakespeare. Murray has as yet not removed the posts in question and has also reproduced the letter his ISP reportedly received from YouGov’s lawyers, on his blog. We contacted YouGov’s lawyer, Dan Tench at Olswang LLP, this morning. We asked why it was pursuing this action: “Mr Murray has made serious false and defamatory allegations regarding Mr Shakespeare and YouGov. He has not sought to substantiate these allegations at all. Mr Shakespeare and YouGov understandably want these allegations to be taken down. This entry was posted in Journalism, Legal, Press freedom and ethics, Social media and blogging and tagged craig murray, David Cameron, polling, stephan shakespeare, uk election, YouGov on April 30, 2010 by Judith Townend. Fascinating behind-the-scenes look at Private Eye as it puts together its election special. They said there’d be no satire after Thatcher; they said there’d be no satire after Blair; they said there’d be no satire after Bush. There will be, because they all make mistakes. They are ready to be parodied already, so we don’t have to worry too much. This entry was posted in Editors' pick and tagged ge2010, Private Eye, uk election on April 29, 2010 by Laura Oliver.